There’s plenty to see and do in Historic Deadwood! But if you can plan a couple extra days, here’s an itinerary that will take you around the Black Hills and to many of the most popular attractions in the region. For more information call the Deadwood Chamber at 605.578.1876 or contact us for more information. Step into history and dig into the past as you enter a real Black Hills underground mine, Broken Boot Gold Mine. Here, one can return to a time when the powerful punch of a miner’s pick and the roaring boom of a dynamite blast signaled the ongoing search for the earth’s most sought after mineral. Want to feel like a ’76 miner? Take a trip back in time by opting for one of the mining-based experiential tours: Miners Morning or Eureka (advance reservations required). Board one of the historic tour buses lead by a Wild West tour guide. The one-hour tours include a trip to Mt. Moriah Cemetery and an earful of Deadwood history. You’ll learn of legendary gunslinger Wild Bill Hickok, scandalous Calamity Jane and the luckiest of all – Potato Creek Johnny. Deadwood has three tours operators – Alkali Ike Tours, Boot Hill Tours and Original Deadwood Tour – all offer group pricing. Experience the oldest museum in the Black Hills – the Historic Adams Museum. This museum exhibits the mysteries, the tragedies and the dreams of Deadwood and the Black Hills. Admission is a donation of $5 for adults and $2 for children. Enjoy lunch overlooking historic Main Street. Outdoor dining is available on top of the Saloon No. #10 at the Deadwood Social Club. This is Deadwood’s finest Italian Steakhouse specializing in handcrafted Mediterranean cuisine and boasts a massive martini and wine menu. On your way, walk through the famous Saloon #10, the only museum in the world in a bar! Visit the Historic Adams House where Deadwood pioneers, Harris and Anna Franklin, once lived. This Victorian abode was described in the local contemporary press as the grandest house west of the Mississippi. Restored and preserved by leading experts in historic preservation, it reveals a time capsule in a place where legends still live. The house is decorated with original furniture and personal items from past residents. Want more? One-up your experience by opting for the special “Tea and Tour” of the house instead (advance reservations required). Honor Deadwood’s first pioneers at the Days of ’76 Museum. The facility features pioneer, Native American, historic firearms, and rodeo collections. It also houses the region’s largest collection of historic horse drawn vehicles. If you are looking for a mighty fine steak for dinner, try Legend’s Steakhouse, the Deadwood Grille or Mavericks Steakhouse. You won’t be disappointed! Looking for casual dining with a twist? Try Diamond Lil’s Sports Bar and Grille, in Kevin Costner’s Midnight Star. Here you can enjoy dinner among the stars and check out Kevin Costner’s movie memorabilia from familiar flicks like “Dances with Wolves,” “Untouchables,” “Field of Dreams,” and “Bull Durham” along with many others. Grab breakfast because it is going to be a busy day! The Hickok House at the Best Western and Lee Street Station both serve a gigantic breakfast burrito that will keep you full all morning. Or, swing by Gold Country Inn, a favorite breakfast stop among locals. 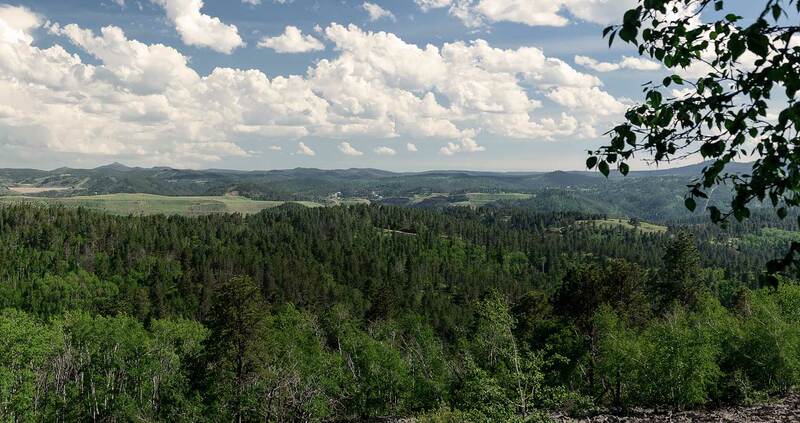 Take Hwy 385, a stretch of scenic beauty, south of Deadwood. Step on guides are available to share the history with you while you travel. This road takes you through some of the finest country in the Black Hills. Take a moment to stop and witness the beauty of Lake Pactola. The area was home to the historic mining city of Pactola. The ruins of that town are now deep under water and the surrounding hills form a perfect and picturesque basin for the reservoir. Arrive in Hill City and board the 1880 Train for a two-hour scenic tour through the backcountry of the Black Hills. Hear the bellow of the engine and the whine of the whistle as it winds its way through the hills between Keystone and Hill City. Upon your return, relax for lunch at the Alpine Inn Restaurant. Located on Main Street, you’ll notice views of Black Elk Peak (formerly Harney Peak) in the distance. The Alpine Inn serves lunch with a European charm and offers veranda dining, reasonable prices, and features homemade pastries and fine desserts. Next, experience the grandeur of the world’s largest mountain carving in progress, Crazy Horse Memorial, just minutes away from Mt Rushmore. Crazy Horse is not just a monument; it is a living symbol of the great chief of the Sioux Nation. If you are hungry and can’t make it back to Deadwood, stop at the Sugar Shack on Highway 385 and enjoy one of the best burgers in the Hills, along with an ice-cold beverage. Head back to Historic Deadwood for an evening of the finest entertainment around. Deadwood’s saloons, casinos and restaurants offer adult and family-friendly fun, from live music to loose slot machines and roaming re-enactors. Take in history, Deadwood style, by attending the Trial of Jack McCall. Jack is the rascal that shot Wild Bill Hickok in 1876. After the stage production, try your luck. Deadwood’s casinos offer your favorite table games – like Craps, Roulette, Texas Hold ‘em, Blackjack, Let it Ride, and Keno – or the newest slot machines. Bet limits range from 1 cent to $1,000. Deadwood has over 80 gaming halls, surely one to fit your fancy. Leaving from Deadwood, head towards U.S. Highway 14A, a National Scenic Byway in Spearfish Canyon. You’ll want to travel towards Spearfish on U.S. Highway 85, head west via I-90 and enter the Byway from the north. History and breathtaking beauty define this Black Hills attraction. Geologists have said Spearfish Canyon is six times older than the Grand Canyon. Spearfish Canyon Scenic Byway features 19 miles of captivating waterfalls, numerous photo opportunities, magnificent cliffs and clear mountain streams, teeming with trout. Hiking, biking and nature-watching are just some of the pastimes here. If you plan ahead and have the time to spare, you can book a fly fishing excursion through High Mountain Outfitters. About 13 miles in, the canyon opens into a jaw-dropping vista; that’s how you’ll know you are almost to your next stop, the Latchstring Restaurant. The restaurant boasts a century’s worth of hospitality and prides itself on appetite pleasing entrees made from scratch. While dining, enjoy one of the most spectacular views of the canyon. While here, allow time in your schedule to explore the two falls nearest the restaurant, Spearfish Falls and Roughlock Falls. On your way back to Deadwood, stop in the mining town of Lead. Up until 2002, it was home to the Homestake Gold Mine, the largest gold producer in the northern hemisphere and one of the deepest in the world. The mine has since been converted into Sandford Underground Research Facility, host to national and international scientific collaborations. To learn about Lead’s past and present, you won’t want to miss the Sanford Lab Homestake Visitors Center. Check out the 3-D model of the underground tunnel system, take a simulated ride down to the 8,000 foot level, jump on a trolley and take a surface tour learning more about mining and the lifestyle afforded to the employees and residents by the Homestake Gold Mine, or hit a hole-in-one into the breathtaking Open Cut. Welcome back to Historic Deadwood. Enjoy the rest of your day walking in the footsteps of legends (be sure to grab a Historic Walking Tour Guide). Watch a shootout in the street or listen to an ol’ time music show. Browse the many gift shops on Main Street. Don’t hold back – explore! Deadwood has a city-wide trolley system and each ride only costs $1! Eat dinner in one of 40 outstanding restaurants: ejoy unforgettable filet mignon, famous buffalo burgers or buffets complete with crab legs and prime rib. Deadwood offers it all.